Large cuts of meat like a roast are typically the best items to throw on your smoker. They have time to absorb the flavor of the smoke and the fat content has a chance to melt down and moisturize the roast. However, since buffalo bison meat is leaner than other meats like beef and pork, this recipe has a couple extra steps in order to ensure a succulent and tender cut of meat is achieved. The last thing you want to do is waste a day smoking and have to order pizza for dinner because your bison is dried out. However, due to the low fat content in bison, it is a healthy alternative to other smoked red meats. This recipe starts with preparing a marinade that will sit in the refrigerator with the bison roast in order to brine the meat. Brining is the process of soaking the meat in a salty water mixture that will cause the meat to retain the moisture internally throughout the smoking process. This brining technique is typically used on low fat meats like bison and poultry. To create the brine marinade, mix all of the ingredients in a pot and then drop in your bison roast. Your bison roast should be almost all the way submerged in liquid. If you need more liquid, you can add more beer or just a little water to the pot. Light your charcoal smoker approximately 30 to 35 minutes in advance of cooking. You will know that your charcoal is ready when all of the coals turn from black to a glowing white ash color. If you have a gas or electric smoker, they can usually get up to a temperature of 225 within 15 minutes. Once the smoker is up to temperature, add your smoker wood chips. Put your bison roast on the grill with the fat side up! You always want the white fat side up when smoking so the fat can melt down into the meat to keep it tender and moist. Your bison roast will take approximately 4 hours to smoke or about an hour per pound. You don't want your bison to be fully cooked or it will turn out dry and tough. 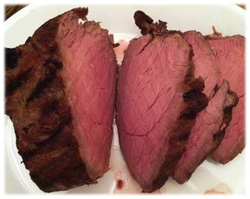 Try to reach an internal temperature of about 150 degrees for the perfect smoked bison roast. Never cut into any meat straight off the grill or off the oven while it is still hot. You want to let your roast sit for 15 minutes wrapped with a tent of aluminum foil once you take it off the smoker. The roast will continue to cook for a few minutes and then the juices will redistribute throughout the entire roast to make it tender.